The Clipsal 500 Adelaide will feature up to two international categories next year as organisers bid to freshen up the event’s support card. Speedcafe.com has learned that two places on the support bill have been earmarked for imported series, creating a squeeze that currently sees the Dunlop Series without an opening. As reported on Friday, V8 Supercars remains in discussions with race organisers to squeeze the second-tier class into the schedule. While the South Australian Motorsport Board is known to have held talks with Formula E over a future stand-alone meeting, the all-electric class is not thought to be in the mix for Clipsal. 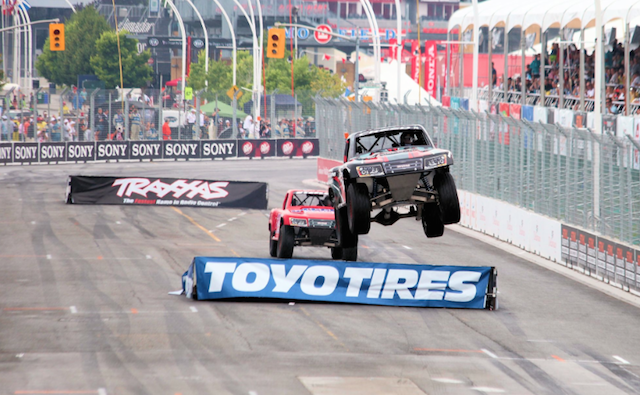 Robby Gordon’s Stadium Super Truck (SST) series is being touted as the most likely import following successful appearances this year at IndyCar Series races and the X Games in Austin, Texas. The category’s purpose-built pick-up trucks feature 600bhp V8 engines and compete on street circuits fitted with temporary jumps to add to the spectacle. Clipsal 500 commercial business development manager Craig Dontas inspected the series at the Long Beach IndyCar race earlier this year. A trip to Adelaide would mark a maiden overseas venture for the SST business, which Gordon sold 40 percent of to an investment firm earlier this week. Other categories linked to possible appearances in Adelaide include the Ferrari 458 Asia Pacific Challenge, which featured at this year’s Ferrari Racing Days Festival at Sydney Motorsport Park. In addition to its Australian sojourn, one-make class holds races in Malaysia, China, Japan, South Korea and the United Arab Emirates. Local support classes are expected to include the Australian GT Championship, Carrera Cup Australia, V8 Ute Racing Series and Touring Car Masters. A Clipsal 500 spokesman told Speedcafe.com that the full support line-up will be unveiled next month. The V8 Supercars component of the meeting will again see two 125km races held on Saturday afternoon before the traditional 250km Sunday leg.